Eating Bugs: The Next Block in the Food Pyramid? If eating bugs makes your skin crawl, you might be in the minority. With more than 1,900 species of edible insects on Earth, bugs are a regular item on the dinner menu. Two billion people regularly munch on insects. Entomophagy (the practice of eating bugs) is common in Africa, Asia, and South America. Insects are even considered local delicacies in tropical paradises. 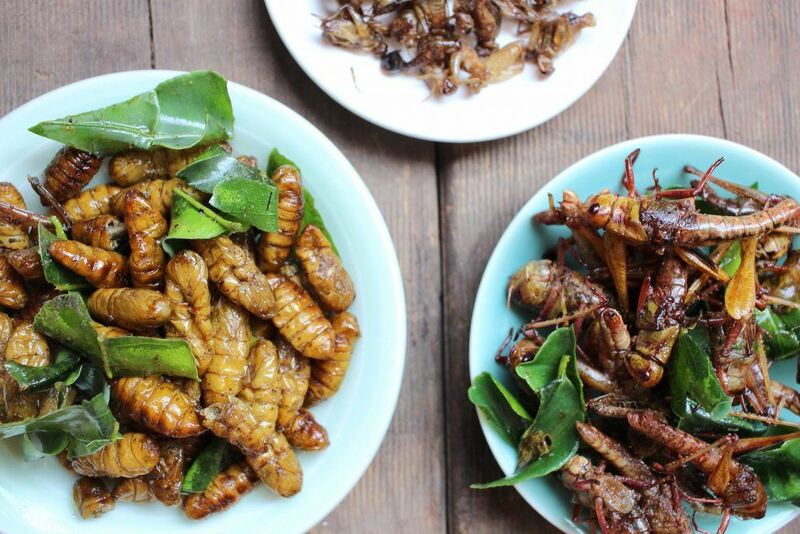 So reprogram your taste buds because insects are actually quite nutritious—and even delicious. Bon appétit! Humans have been eating bugs for ten thousand years. Hunter-gatherers ate bugs to survive when resources were low. They learned which bugs were edible by observing animals. This helped them steer clear of poisonous insects and spiders. Bugs quickly became a regular source of nourishment—one that has persisted to this day. At first glance, insects do not seem to make a great meal. But when compared to other protein sources, those tiny bugs offer more than meets the eye. Grasshoppers are more densely packed with protein than beef. And they differ from beef in two other categories: fiber and fat. Per ounce, grasshoppers have less fat and more fiber. Grasshoppers are not the only insects worth mentioning. There are several other bugs on dining tables throughout the world. Beetles are a favorite snack of people living in the Amazon basin and parts of Africa. They are richer in protein than other insects. Beetles are also great at turning cellulose (plant sugars) into digestible fats. Ants are tiny but they have a lot to offer your body. One-hundred grams of red ants provide more protein than 100 grams of egg (about two boiled)—approximately 14 grams for ants to 12 grams for eggs. Ants are low in calories and carbs, so they’re a real bargain for the calorie-conscious. Crickets, grasshoppers, and locusts are the most commonly eaten insects. This could be because they are easy to find and catch. Many people say that roasted crickets taste nutty. These bugs pick up the flavor of whatever they are cooked with and are popular in stir-fries and curries. Stinkbugs are hidden treasures of insect cuisine. They are said to add an apple flavor to your cooking and are a rich source of iodine. Bees are already sources of a crowd favorite—honey. But bees themselves are eaten, too. The indigenous peoples of Africa, Asia, Australia, and Mexico eat bees when they are still young. The egg, larval, or pupal bee brood taste like peanuts or almonds. Watch out for adult bees. They can sting. The current world population is seven and a half billion. To feed their growing populations, many world leaders are looking for sustainable sources of protein. Eating bugs provides a solution. Insects made headlines in recent years because they’re cheap to grow and easy on the environment. Many call bugs “eco protein” because of their efficiency in converting plants to protein. This makes insect farming more efficient than raising cattle. Bugs require less water than livestock and take up less space. One-hundred pounds of cattle feed is required to produce 10 pounds of beef. But the same amount of feed yields 45 pounds of cricket. Fans of “eco protein” are also excited about eating bugs as a method of pest control. Harvesting insects may be a more environmentally conscious solution to controlling the pests that destroy crops. That’s why insect cuisine is gaining traction as an alternative to pesticides. Whether you eat bugs, beef, chicken, fish or vegetable sources, quality protein in your diet is a must. Protein is essential to physical fitness. Most people understand that protein builds muscle, but it does much more than that. Your connective tissues are rich in protein. Hair, antibodies, blood, and enzymes all require protein to function properly. Dietary protein is often misunderstood—with many not understanding the current recommendations and guidelines. Current dietary recommendations say you should get 10 to 35 percent of your daily calories from protein. There are lots of ways to do that. Animal meat is a good source, but so are Greek yogurt, milk, beans, cheese, nuts, and eggs. And you can consider insects in that list of protein sources, if you are brave enough to try eating bugs. If you’re looking to spice up your diet, look no further than the bugs outside. Eating bugs is perfectly safe—as long as you get the right ones—and it’s an excellent source of protein. Your body needs protein to keep you healthy and active. But if you’re nervous about trying a bug with your next meal, consider the positive environmental effects associated with bug farming. And you won’t be alone. Join the billions of people who make insect protein a regular part of a healthy diet. https://askthescientists.com/wp-content/uploads/2017/10/AdobeStock_101945508.jpeg 800 1200 Sydney Sprouse Sydney Sprouse2017-10-23 10:02:032017-11-03 09:49:22Eating Bugs: The Next Block in the Food Pyramid?